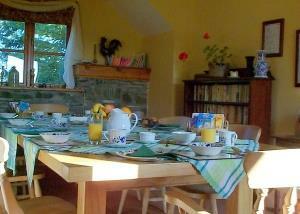 We welcome well-behaved dogs to all our accommodation apart from the farmhouse B&B room and the dining room. Note the Jervaise, terracotta and Thistle rooms are actually all within the Barn End Cottage and are not normally available for B&B unless booked together. We require a £10 per person deposit with booking and the balance is due after breakfast on your departure day. Please note that we are unable to process credit cards. Payment by BAC's or cheque. International visitors please contact us for payment arrangements. Do feel free to contact us if you have any problems at all with the online booking system!